if you install the capacitor backwards the lights will still work but then the capicitor blows and you need to try again with a diffrent one. also what kind of product should i use to tap the capacitor to the balast wire? Take Radioshack capacitor for example. There is " >>>>> " symbol on the capacitor. POSITIVE >>>>>> Negative is the Correct way! Use direct connect w/ electronic tape is the best way, since the capacitor's lead is long enough to do that, or you can use heat-shrink tube to seal them. Ballast meant to get hot! Just make sure it is properly insulated and keep it away from ABS controller. In hot summer, inside the hood, EVERYTHING will get hot. But don't worry, HID kit is not rocket science. Just think of it as a super bright halogen bulb w/ attached extension cord. So you got this to work on the E63 foglights? And do the fogs still turnon when turning? Is anyone running 3000k HIDs for the fogs? I am very interested in running yellow HIDs in my foglights but want to make sure it works. I see that No_Clue is in my neck of the woods so perhaps he could help? It has been more than 20 years since physic 101. 3000k light produce lower freqency wavelength, travel further w/ less heat. In other word, it can penatrate better than higher frequency wavelength. I would strongly vote against putting 3000k HID for your normal driving light. It will not reflect like higher frequency color wavelength. It might be great if you are driving in the rain or fog, but most likely you can NOT even see the "STOP" sign under clear night. Thanks No_Clue, I agree and that is why I want to run the 3000 HIDs for the foglights and keep the 4300 for my driving lights. I am just curious to know of how many have managed to make the HIDs work on the E63 foglights and whether there were any error messages, flickering and if the active turning still worked. Also any recommendations on where to buy the HID kits? I found one on ebay for $130. Will this work? Dont' know about AMG though..
hey guys... i'm new around here and have found this thread very very useful. i did the capacitor mod for the hid kit i bought for my 04 e320. but after i run the car and lights for a few min the capacitors get really hot. i don't know if i just have the cap on the wrong way. does the neg end of the cap connect to the black (ground) or does it connect to red (power)? (+) end of cap connected to ground. I just don't want anything to blow up. If anyone could help i'd really really appreciate it. Last edited by bjferrer; 09-10-2007 at 12:57 AM. Positive should go w/ power. Negative should go w/ ground. BUT!!!! I have no idea where did you get your capacitor. I will ONLY advice capacitor from RadioShack for clear instruction. it's a radio shack cap. the same one as in the pictures from the earlier thread. you can read from 10th reply up. Excellent write-up! We sell our kits with similar capacitors that plug in-line. They definitely help. Also we have D2SHID replacements, those can be purchased here. I have fitted my cheap ebay HID kit today and had lotsof flickering.. If i start the engine and then turn the lights on they dont come on.. after a few seconds they try and start flashing on and off.. If i turn the engine off.... then turn the light on and start the engine afterwards they work fine! Very wierd...! I can then turn them on and off at will and they work fine.. So just have to remember to turn the light on first before the engine! any ideas why?... is it because i have not got the Xenons present setting changed by MB? UPDATE - if i start off with the lights off and then after a fewmins turn the lights on they dont start and i get the BULB OUT warning on the display!! Last edited by dward; 09-28-2007 at 01:35 PM. Don't know how C-klass work. But do you have capacitor on each side? I know I'm bring this back from the dead,but I just installed hid's into my fog lights(W209).And didn't get any luck with the smaller capacitor,BUT after trying out the upgraded (4700µF 35V 20% Axial-Lead Electrolytic Capacitor) That did the job. Thanks for the good info!!!!! I'm new to the board.. When I started reading the thread I had more questions, but the more I read, you guys answered most of them. I've got a '03 E500 and I want to upgrade to HID, but have been leery of the HID systems for sale on eBay ond other sites. I've got a 2001 Chevy Suburban Z71 with a McCollough HID Conversion kit. The 8000K system produced a brilliant blue light that made my truck 'stand out'. I kinda want the same for my E500, but was apprehensive about installing anything. This method work great for me. My only problem was the poorly made HID system. The ballast's crapped out on me after a cpl of months. Now i dunno which company to trust. Any recommendations? 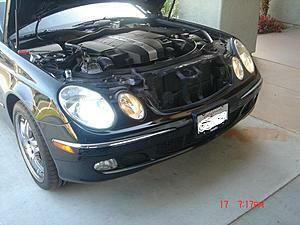 I just finish install a HID kit and been testing for the past weeks.. This kits does NOT require a capacitor like other kit. Its "plug and play". Only modifcation you would need to do was enlarge the stock bulb hold to fit the HID bulb. 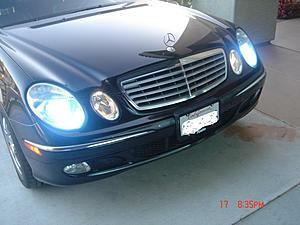 I place the HID ballast inside my headlights (there's plenty of room) for a clean oem look. 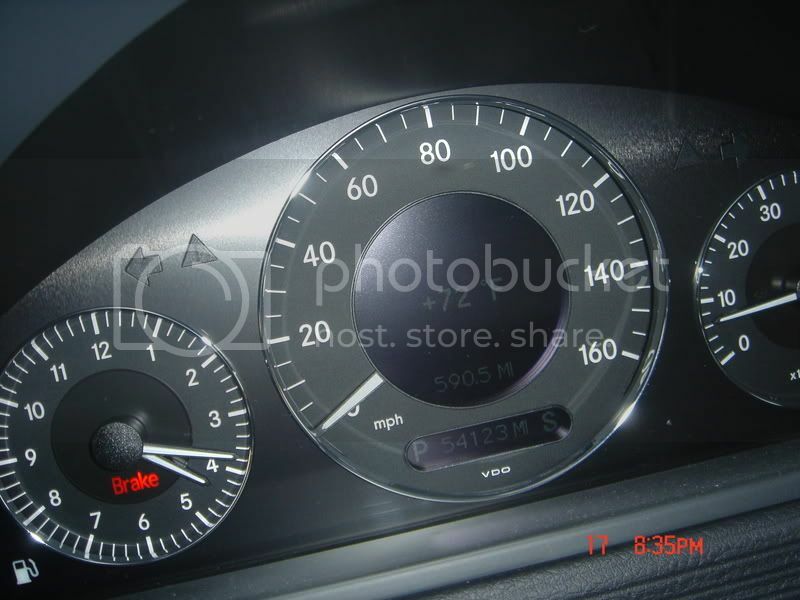 Most important it DOES NOT display the error code or required you to visit the dealership to turn on the HID option (=$$$$)... Oh.. NO FLICKER with engine off and on!!!!. Last edited by angeleye328i; 11-20-2007 at 12:20 AM. 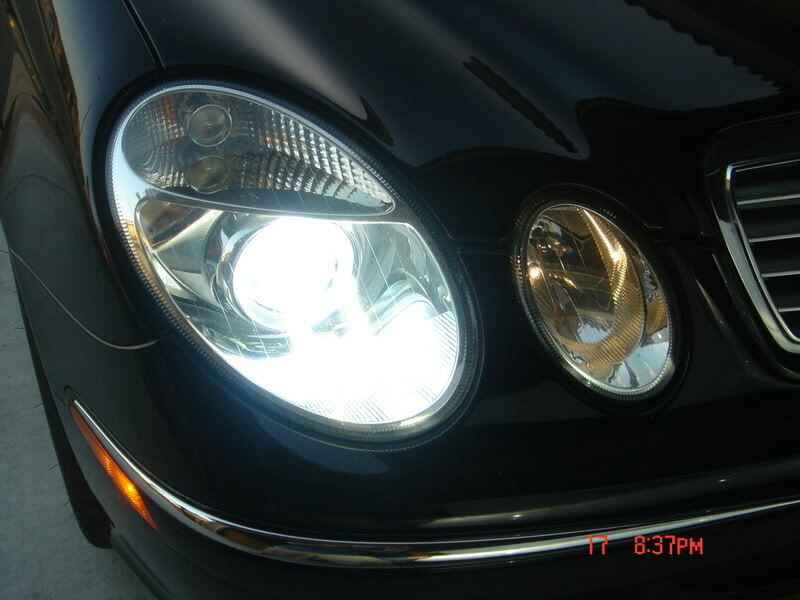 I had HID installed on both fog and head lights and they worked perfectly for over a year. Now that the year is done, the right headlight does not come on at the start of the vehicle 4 out of about 5 times. 1 out of 5 start ups are flawless and I have no problems. Out of the 4 times, once i start driving, the headlight eventually turns on. Another thing I noticed is my right fog light (only sometimes) starts to flicker. Im going to try the capacitor sometime soon.